Birchas Ha’Zevach. First edition Amsterdam 1669. 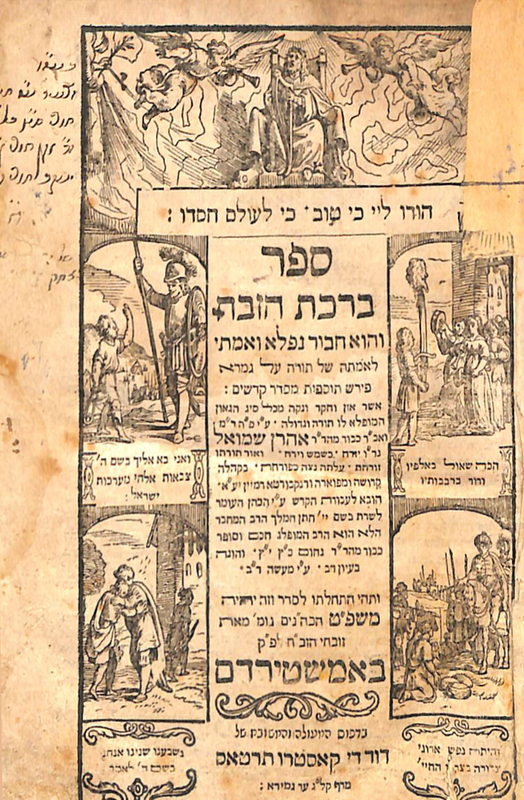 Important commentary to the Talmudic tractates of Kodshim. Title page depicting five Biblical scenes. Vinograd Amsterdam 364.Tartas press. 2, 180, 35, 1 pages. 16.5 cm. Good/fair condition, some foxing and minor worming. Some repairs. One page slightly torn. Modern binding, leather spine. Emunas Shmuel. 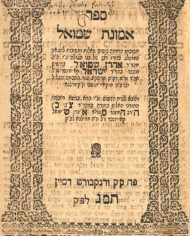 First edition Frankfurt 1683. 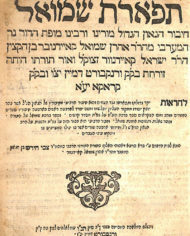 Halachic responsa. 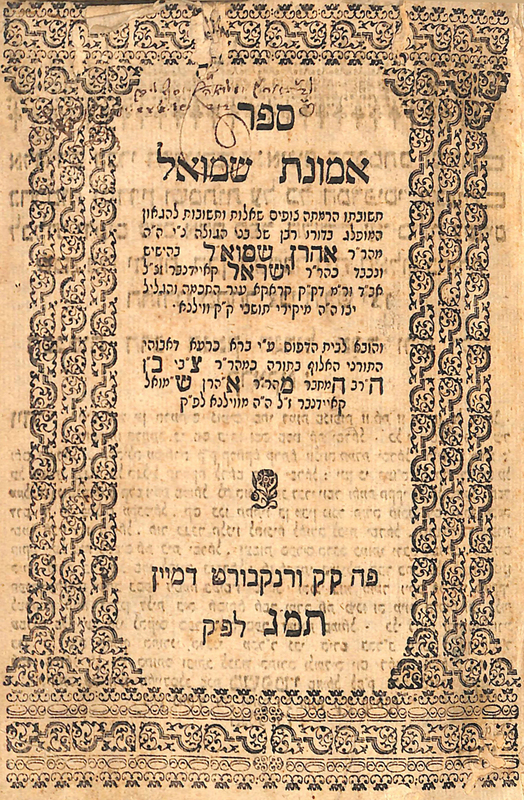 Particularly important, as the author was closely associated with many of the era’s greatest Poskim including the Chelkas Mechokek, the Shach and the Bach. Vinograd Frankfurt 55. 64 pages. 18. 5 cm. Overall good condition, some damage to first few pages including title page with minor loss of text. Fine wood and leather binding with clasps (lacking lower clasp). Tiferes Shmuel. First edition Frankfurt 1696. 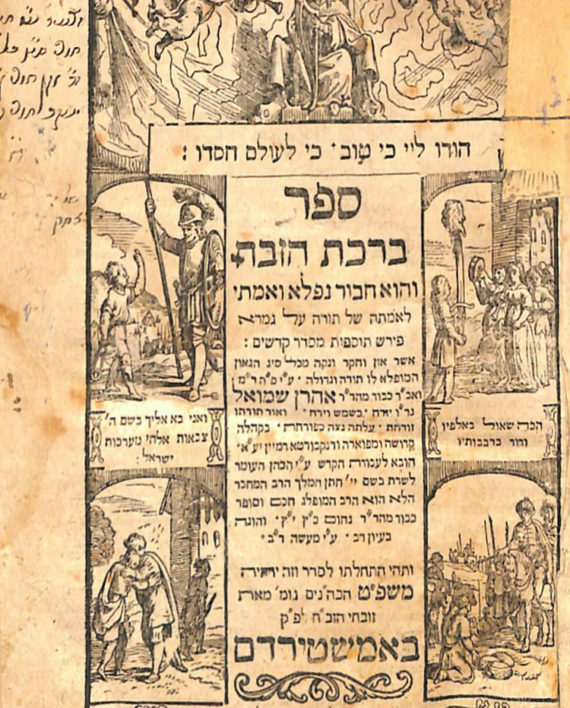 Talmudic novella on various tractates as well as his classic commentary on the Rosh. Vinograd Frankfurt 131. 2, 126 pages. 19. 3 cm. Good condition. Modern binding. 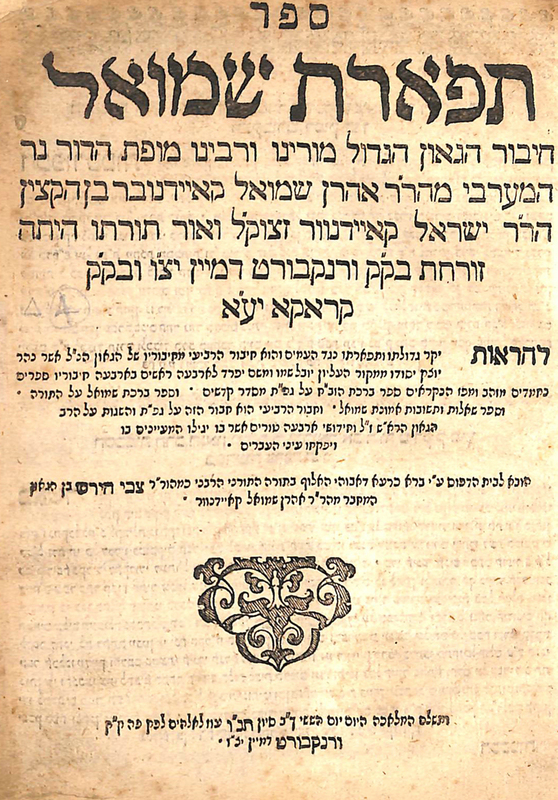 R. Aaron Shmuel Koidonover known as the Ma’HarAShK, (1624-1676) was a disciple of R. Yaakov of Lublin and R. Herschel of Krakow. He served as Rav in Reisha, Biala and Vilna but during the Cossack massacres (1648-49) was forced to flee to Vienna. However due to the Polish- Swedish war in 1655 he was again forced to flee this time to Lublin. Tragically two of his daughters were murdered by the Cossacks. He unfortunately spent most his life wandering, due to war and persecution but despite all hardship authored various important works and was recognized as one of the Torah giants of his era.